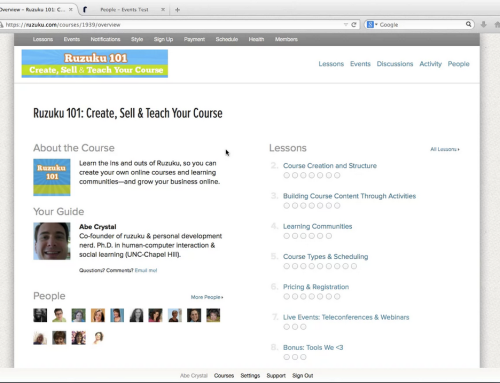 Ruzuku was designed around the idea of having a fixed “start date” for courses. 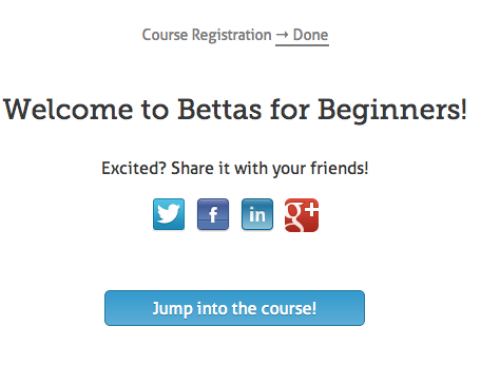 The idea was that you pick a date for your course to start, get people to sign up for the course before that date, and then have everyone in the course start learning together. We’ve realized through our own experience and conversations with customers that this approach is too limiting for many types of courses. So, we’re opening the floodgates! After you set a start date, registration for your course is “live” and students can sign up at any time, until the last day of the course. No more problems with students being “locked out” of a course. Of course, there are still cases in which you’d like to control access to your course, so we’re providing some controls to do that. Course registration is open and closes at the end of the course. In other words, students may register at any time. This is what we recommend for most courses, and there’s no need to change this setting unless you have a specific need to do so. Course registration is open and closes at the end of the first Step. If you’d prefer that students don’t register too late, this is a good middle ground. People who miss the start date of the course will still have a few days to register (depending on the duration of your first Step). For example, if your first Step is four days long, then students will have four extra days to register. Course registration is open and closes when the course starts. This is the strictest option: students will be unable to register after your course starts. Course registration is closed. This means no one can register for your course. But don’t worry, you can always re-open registration later. Log in to ruzuku and go to “Schedule and Pricing” for one of your courses to check it out!